As I do my Starlet Series on Youtube, I thought I'd post a celebratory post for each of the ladies we visit. 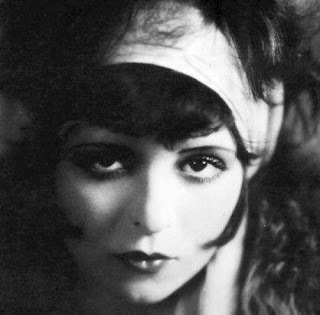 Clara Bow was the 'it' girl of the 1920's...in fact, she might have coined the phrase. Before the rise of women in the workplace, she was the first 'blue collar' screen siren-often being cast in the role of a waitress, a salesgirl, or even a sassy manicurist. Her pretty face held just the right mix of childish innocence and vampish vixen to make her especially memorable. Though her lack of education and raw presence may have caused her to be looked down upon in the high society of the day, she clearly deserves to be in the ranks of both Gish and Garbo. Clara was born in 1905, among dire circumstances. She was unwanted and inconsequential to both her mother and father. There was not even trouble taken to file a birth certificate since her mother was certain the baby would eventually die of heat exhaustion. Mother and Grandmother both suffered from mental illness and therefore could hardly be counted upon to give the child a proper upbringing. Clara's fater was a wastrel and her mother resorted to selling herself in order to provide for her daughter. The terrified child reportedly hid in closets during these 'visits'. It is no wonder she grew up with a speech impediment and a sad lack of companionship. Except for the movies. They were her best friends and watching actresses like Theda Bara was the catalyst she needed to enter a fan magazine contest and eventually win her way into the film business. At sixteen, her range of emotion and startling beauty were exquisitely captured on film. After several unsuccessful efforts, Clara finally broke into the mainstream by performing a series of films for Preferred Pictures, at the rate of 50.00 a week. She had a knack for showing any demanded emotion, almost at the drop of a hat, and without any apparent concentration. 'Ya want me to cry? ', she'd ask...and upon receiving an affirmative response, was known to park her gum behind her ear and immediately dissolve into a river of tears. This command of dramatic acting was evident in roles that called for it, but it was Flapper roles that won her popularity, as well as her much publicized love affairs. This publicity may have led her to downfall, as an actress, when media attention eventually overshadowed her success as an onscreen personality. A series of flops as well as a nervous breakdown during the filming of 'Kick In', her final Paramount feature, resulted in her making a drastic decision-it was time to stop making movies. Over the years, revivals have brought her back into the public eye and champions of her talents, like Hugh Hefner, have worked hard to get her catalogue of films restored and available to the masses. In spite of her wild reputation, Clara was a gifted actress and deserves recognition for her contribution to film.